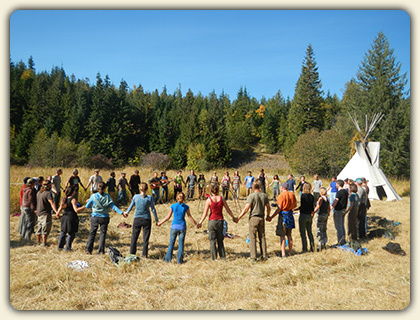 Do you yearn for holistic nature based community? Do you yearn to spend your days with people you share a heart connection with? Do you love nature, and want to live in a world honors it fully? Do you believe it takes a village to raise a child? Our answers to these questions is a huge YES! As you may know, restoring holistic nature based culture is a huge passion for us here at Twin Eagles, and continues to be a driving force guiding us to do what we do. Of all the events we host here at Twin Eagles, there is one in particular that most fully embraces these qualities. And it happens to be coming up very soon right here in the Inland NW. It's a dynamic workshop called the Art of Mentoring. Guided by a national team of highly experienced facilitators, this inter-generational village-style workshop draws on indigenous wisdom and principles observed in nature. Here we learn about the skills and Art of Mentoring, honing in on time-honored principles shared by our ancestors and from cultures around the world. We explore the role of mentoring in society and culture. In that discovery, we seek to restore the best of cultures that were deeply connected with nature, thus opening up a living time-capsule for our experience. Each day includes personal and group activities steeping ourselves in the mysteries of the land. We use storytelling, music, sensory awareness exercises, ceremony, theater and other creative arts as our vehicles for learning and transformation. We'll explore the roles of elders, women, men, and children in culture and the journey we all must make to become whole again. With the beauty and healing balm of nature we will create an inter-generational village steeped in a rich culture deeply connected with nature. This workshop will provide you with a rich experience, robust tools and vital practices of mentoring that will enhance and deepen your relationships and allow you to create a strong culture of nature connection in all aspects of your life be it personally and in your family and community. Click here for more information on the Art of Mentoring. Please note that we still have significant scholarships and group discounts available. Don't let lack of finances stop you. If you are interested in attending, please contact us, as we want you to come and are willing to work with you! We hope you'll join us for this exceptionally special event!